Have you considered a LinkedIn company page for your book promotion? Many authors, writers and bloggers use their personal profiles on LinkedIn for marketing their books and blogs. While this is a very good idea, there is a better way to extend your reach to more targeted audiences. You are probably self-employed or working part-time on your writing. So this means that you have a small business and you should promote it. If you are a LinkedIn member you can create a free company page. Once you have set it up, people will be able to search for your company or for you personally. You can also connect your LinkedIn business to your LinkedIn profile, which gives people two ways to find you. With these ideas in mind, it might be worth looking at the benefits for you in setting up your LinkedIn company profile. When you are logged into your account, you can find the link by clicking “Work” in the header menu, and then at the bottom of the drop-down box, click “Create a Company Page” to add your company. Or, if you have a LinkedIn account and a verified email address you can start by going to LinkedIn’s Create a Business Page Getting Started page. The basic set up is very easy, so I won’t waste words by going through it step-by-step. But there are some small issues that I discovered that might help you. You need two images. A header cover image and a company logo. The sizes are not clearly explained, but after a few tries, I found what works. For your logo, it must be square and around 200 x 200 pixels works fine. For the header, it gets a little lost behind menus. But I found that an image size of 1530 x 500 pixels seems to work okay. But you may want to experiment. My only other recommendation is that if you have a separate company email address, it is better to use this than your personal email. When you have finished, you will find your new page by going to “Me” in the header menu. In the drop-down, you will see your new company listed. LinkedIn is all about companies, thought leadership (whatever that means), employees and job openings. So it has the facility to add employees profiles and current employees to companies. Now that you have a company, all you need to do is add yourself as an employee. Go to your personal profile, and in the “Experience” tab, add your current position with your new company by clicking the + button. When you start typing your company name, the field should auto-fill with your logo. Complete all your details but make sure you click “I currently work here” so it will appear at the top of your experience tab in your profile. Now people can click on your company logo and go to your company page. Obviously, you can share content and add company updates or share your latest company news. If you are using a social media auto-poster, many have a LinkedIn API you can use to connect. 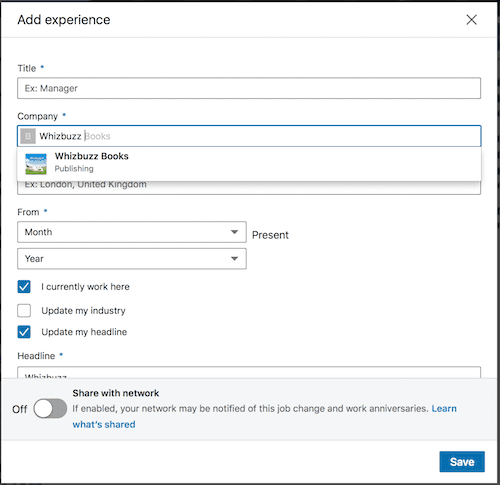 You can then automatically post your blog articles to your new LinkedIn company profile. When people follow you, they will receive your company page items in their news feed. You can also add showcase pages, which could be a very good option for authors to highlight their titles. I haven’t added any as yet, but you might find a use for this option if you are offering a range of different services or products. Your new business page will be a bit lonely at first. To encourage people to follow your company, you can try adding a link to your emails or try a few posts on other social media such as Facebook and Twitter. Go slow though. If you post quality content, people will get curious and will want to learn about your business. In only a few weeks, my new page is recording impressions, shares and new followers. Take your time, be patient and let it grow. If you are interested, you can see the result of the page I added recently for my other website, Whizbuzz Books. Oh, and yes, you are welcome to follow it! It is no news to anyone that Facebook is having issues. Twitter also, but not quite as bad. As these two platforms have been for so long the go-to social media networks for book promotion and blog content distribution, it is wise to look for alternatives now. LinkedIn is a good choice. It is a very stable network with good ethics and a user base that is much more reserved than other platforms. That makes it a great alternative and opens up possibilities for writers to expand their professional horizons and perhaps to B2B networking. There are also more possibilities with LinkedIn for authors to connect with small press publishers and literary agents. It doesn’t take long to add a LinkedIn business page, so it might be a half an hour of your time that is well invested.